Within athletics, the most frequently encountered injury is the ankle sprain. This is especially true in regards to basketball and soccer with up to 45% and 31% respectively of all injuries cited as ankle sprains. In addition, 7-10% of all emergency room visits are due to ankle sprains. Approximately 30,000 people experience this injury each day in the United States. The ankle ligaments are elastic structures that hold the ankle bones and joint in proper position. They protect the ankle joint from abnormal movements-especially twisting, turning, and rolling of the foot. Ligaments usually stretch within their limits when placed under stress and then go back to their normal positions. When a ligament is forced to stretch beyond its normal range, a sprain occurs. A severe sprain causes actual tearing of the elastic fibers. * Typically, sprained ankle ligaments will heal with simple conservative, non-surgical treatment in approximately 85% of patients. This is commonly done with rest, ice, bracing and formal physical therapy. Those patients who continue to have ankle pain or instability may be candidates for ankle ligament surgery to repair the ligament. Traditional surgical methods require large open incisions to expose the ligament and repair it and a long recovery. 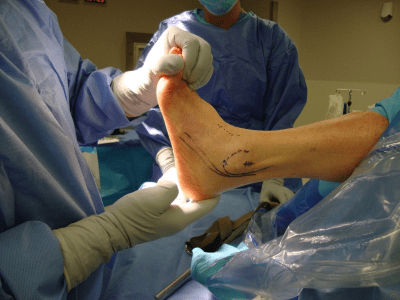 New ankle arthroscopy methods allow the ligament to be repaired from inside the ankle joint using very small equipment and incisions. This technique has gained favorability among foot and ankle surgeons. Arthroscopic ankle ligament surgery avoids a large incision, provides a more cosmetic outcome, quicker healing, fewer complications and less pain. Clinical studies have shown Arthroscopic repair of the ankle ligaments to be a very effective method of treatment. Dr. James Cottom of Florida Orthopedic Foot & Ankle Center has helped pioneer this technique. He has lectured around the country, taught other surgeons and has published recent articles in peer-reviewed journals discussing the benefits of using this minimally invasive arthroscopic surgery technique in repairing chronic lateral ankle instability and reducing pain. Dr. Cottom has also published biomechanical studies demonstrating the increased strength of these novel repairs that are allowing patients to get back to sports and everyday life very quickly after the procedure. The Arthroscopic technique is allowing patients to actually put protected weight on their operated ankle 3 days after surgery. Typically, formal physical therapy is initiated at 3 weeks after surgery and patients are allowed back in a regular shoe with an athletic brace at 4 weeks after surgery. Dr. Cottom has used this post-operative protocol in hundreds of patients with excellent outcomes. If you are suffering from chronic ankle sprains or pain, this minimally invasive procedure may be an option. Cottom JM, Baker JS, Plemmons. Analysis of two different arthroscopic Brostrom repair constructs for treatment of chronic lateral ankle instability in 110 patients: a retrospective review. 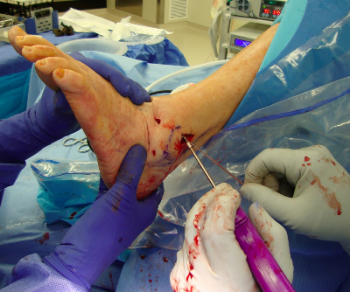 Submitted J Foot Ankle Surg (Jan 2017). Cottom JM, Baker JS, Richardson PE, Maker JM. A Biomechanical Comparison of 3 Different Arthroscopic Lateral Ankle Stabilization Techniques in 36 Cadaveric Ankles. J Foot Ankle Surg. 2016 Nov – Dec;55(6):1229-1233. Cottom JM, Baker JS, Richardson PE. The “All-Inside” Arthroscopic Broström Procedure With Additional Suture Anchor Augmentation: A Prospective Study of 45 Consecutive Patients. J Foot Ankle Surg. 2016 Nov – Dec;55(6):1223-1228. Cottom JM, Rigby RB. 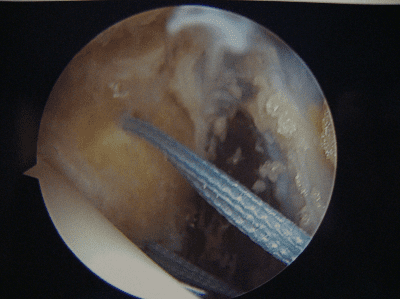 The “All Inside” Arthroscopic Brostrom Procedure: A prospective study of 40 Patients. J Foot Ankle Surgery. 52: 568-574, 2013. 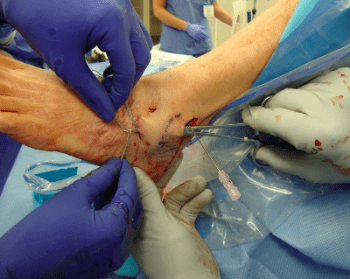 The “All-Inside” Arthroscopic Brostrom Procedure with an additional suture anchor augmentation: A prospective study of 45 consecutive patients. Techniques in 36 Cadaveric Ankles. Arthroscopic Brostrom with a Suture Anchor Augmentation. A retrospective review of 50 open Modified Brostroms vs. 50 “All inside” Arthroscopic Brostrom Procedures. 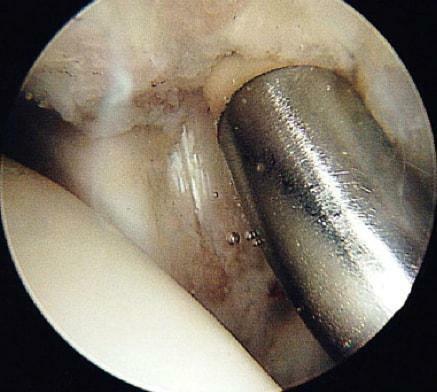 The “All Inside” Arthroscopic Brostrom Procedure. A Prospective Study of 30 consecutive patients. The tendons and nerves are identified and marked with a pen. The distal fibula is marked along with an accessory incision site 3cm proximal to the tip of the fibula. Looking inside the ankle joint and cleaning out the scar tissue at the lateral aspect of the joint. In addition, preparation of the fibula is performed for bone anchor placement. Two bone anchors are then inserted into the anterior face of the fibula. The sutures are then passed out through the sinus tarsi area with a percutaneous suture passer. All 4 sutures have been passed with minimally invasive techniques and spread out in the sinus tarsi area. 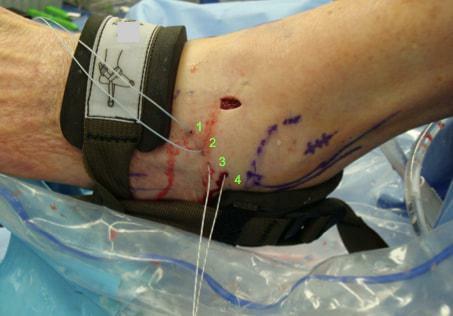 A small accessory incision is made in the midline of the distal fibula and the sutures are brought proximally into this incision after the sutures have been tied. The sutures are then anchored into the distal fibula to add additional support and strengthen the repair. After the closure of the skin looking at the front of the ankle. Note the 3 small incision sites. Dr. Cottom has published both biomechanical and clinical outcome studies in peer-reviewed journals utilizing this technique with excellent outcomes.